Masculine. I am in need of some Father's Day cards, so that is what I decided to do with this week's cue word. Perhaps you remember this plaid that I made for a challenge a few weeks ago? I had one piece left, and so I made it the focal point of this Father's Day card. Lately I have been fussy cutting my sentiments and popping them up on my card wherever I think they look best. Here, I placed my sentiment across all three elements of my card, tying them together. Now, it's your turn. How does MASCULINE inspire you? I hope you play along this week. Please remember to keep it Clean and Simple. Fantastic plaid, Joyce! I love the color choices in this one too! I love this plaid pattern, Joyce! It's perfect for a masculine card, and your red border really makes it pop, too! Fabulous take on the Cue Card, as always! excellent way to use scraps! Love the plaid, love the colors! Nifty card Joyce! Great plaid, Joyce! Love the colors! Perfect! 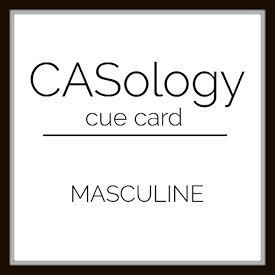 Love all your amazing masculine cards this week Joyce! Love that great plaid panel, Joyce!!! What a lovely CAS design!!!! Yaaaassss to making use of that plaid panel and I love the sentiment placement! Joyce...just love your wonderful plaid, what a fabulous choice of colors too! Joyce I love your plaid design, a perfect Father`s Day card! Loving the plaid and, especially, the sentiment that bridges all your layers! Yes, it does 'tie' all the elements together wonderfully! Love these colors and the plaid looks perfectly amazing!